Once you have met the requirements of the VCRA and played at least 3 games in no less than 2 months you are able to register with UKARA. When you complete the registration process you will be given a Tech Brigade membership number. 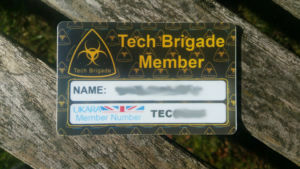 You will then be able to request a Tech Brigade Membership card, generously provided by Combat UK in Stevenage, with your name and UKARA Player registration number on it. This card will also entitle you to a 10% discount on purchases at Combat UK. There is also a tradition at Tech Brigade of “Badging” players. You may have noticed that some players wear “Team Tech Brigade” patches. While we do have Tech Brigade patches for sale they are just the Tech Brigade logo (see the Merchandise page for details). The “Team Tech Brigade” or “Rifle” patch is a patch you cannot buy. The only way to get this patch is to be “Badged.” That is you have to earn it. The patches are in the gift of the longest serving Tech Brigade players. Every so often they will meet up and review regular players at our site who have impressed with their sportsmanship, quality of play and all round Tech Brigade spirit. Those who meet the exacting standards of selection are presented with their Team Tech Brigade Rifleman badge.